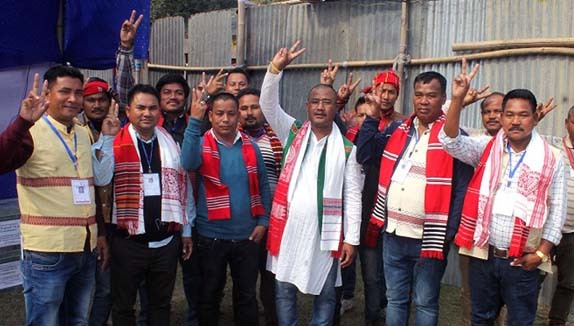 Bharatiya Janata Party (BJP) and its ally Sanmilita Gana Sakti (SGS) swept Mising Autonomous Council (MAC) and Sonowal Kochari Autonomous Council (SKAC) elections in Dhemaji district by capturing all seats. The BJP-backed SGS swept MAC polls by winning most of the seats of the Council in the district while the saffron party won all four SKAC seats. A number of old faces including former Chief Executive Councilor of MAC Paramananda Chayengia (No.17-Mingmang), vice-chairman Kanak Doley (No.9- Muktiyar) have been re-elected from their respective constituencies while former members, namely Jogyeswar Kutum (No.11-Ujani Sissi), Johan Doley (No.12 Namoni Sissi) Raju Medak (No. 3 Gali-Bijoypur) and Pratap Ch Taye (No.9- Muktiyar) have retained power. Among the new faces, All Mising Students Union (TMPK) president Naresh Kumbang (No. 2 Murkongselek-Jonai), Bobi Kanta Doley (No. Owang-Jonai), and few others have been elected to MAC from different constituencies of the district. The ruling BJP fielded its party candidates in MAC polls by seat-sharing with Sanmilita Gana Sakti (SGS). The saffron party contested in four MAC seats under Dhemaji sub-division, but left all seven seats for its ally SGS in Jonai. The BJP managed to capture only two seats in MAC but won all four seats of SKAC in the district. On the other hand, BJP candidate Bijoy Saikia, who is a kin of Lakhimpur Lok Sabha MP Pradan Baruah, has captured the lone Jonai (ST) SKAC seat in Jonai sub-division. Saikia defeated his nearest contestant Harshajyoti Kochari (Independent) by a margin of 833 votes. Saikia got 2,577 votes and Kochari bagged 1,744 votes wherein Congress candidate Jan Hazarika managed to get only 969 votes. The other BJP candidates who won SKAC seats are Tankeswar Sonowal (Gogamukh), Nandini Deka (Batghoriya) and Deeprekha Das (Dhemaji). The Dhemaji district administration conducted the council elections in 15 MAC and four SKAC constituencies. The election commission adjourned council polls in No. 10 Akajan MAC constituency while one Malendra Narzary of SGS candidate, who filed nomination for No. 6 Sanjari Nigir MAC seat, was declared winner unopposed. The MAC with its head office at Gogamukh in Dhemaji district has a total of 36 constituencies out of which 17 fall in Dhemaji. It has been observed that BJP with its ally SGS will rule the elected council for the second consecutive term by absolute majority. Interestingly, opposition Congress could not manage to bag any seat in the council elections in the district. There was no election for Rabha Hasong Autonomous Council (RHAC) conducted in Dhenaji district as no constituency of the council has been set up so far.